Upgrade the external cable from 10 meters. This is for larger buildings who need extra cable from roof to the Booster inside. Upgrade your warranty from 1 year. The Pro Boost 1800 MHz, is the best and most advanced solution to amplify your weak signal in areas up to 1000 square meters. 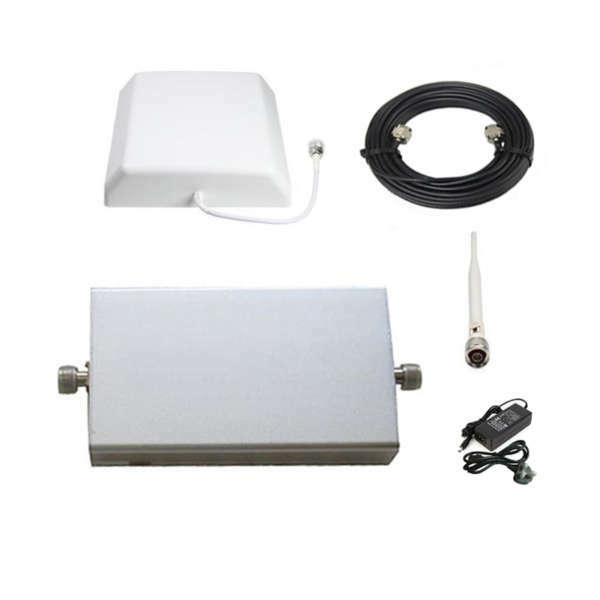 This type of Cell signal boosters is ideal for large properties. Comes with the complete kit that has everything you need to boost your signal strength. Supports 10 users simultaneously and boost perfectly the voice and data signal 4G in Australia. How does it work? With the external aerial antenna, the phone signal booster takes the existing weak signal from the cell tower. Then, the internal antenna pushes out a full strength signal inside. The installation process is very easy and simple. Follow step by step the instructions guide. Usually, it just takes few minutes to set it up. Please read properly the instructions before the purchase as you may need to purchase additional items for the installation. Check our easy follow instructions HERE. The Picture shows the upgraded YAGGI antenna. This antenna is not included unless you pay to upgrade it. If you have a weak 1-3 bar signal, you need to upgrade to YAGGI antenna. This will guarantee the unit to work to its full potential. If you are uncertain about what Mobile phone signal booster you need, do not hesitate in contacting us. The boosters antenna reaches out to the cell tower to access voice and data signals. The booster receives the outside signal, amplifies it up to 32x, and sends it to the inside antenna. The inside antenna broadcasts the boosted signal to devices inside the home. Mobile Booster provide mobile phone signal boosters to cover areas from 300sqm to 5000sqm. Through the years, www.mobilebooster.co.uk ranked a remarkable position in the Mobile Phone Industry. Becoming the favorite supplier in the U.K and worldwide. We are committed with each one our customers to deliver the best quality Mobile Phone Signal Booster.